This unique Chinesco ceramic sculpture, possibly representing transformation, is in a curved abstract form with the head at one end, and the flared spout at the other. 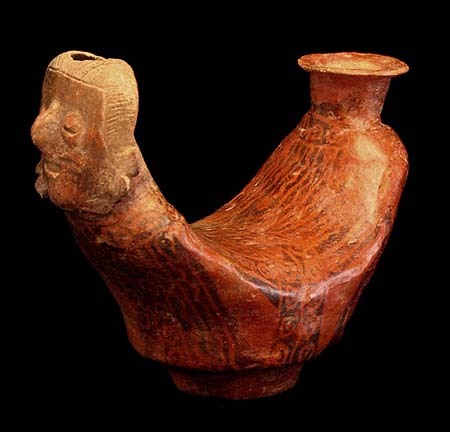 The finely incised hair, coffee bean eyes, ear ornaments, and remains of facial tattooing, are consistent with the Chinesco style of Nayarit ceramic art. There are multiple intricate abstract black resist design elements against the red slip over the entire body. The base is footed and concave. Provenance: From a private Arizona collection formed in the 1960s-'70s.